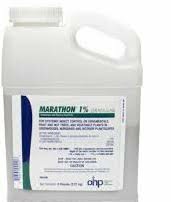 OHP Marathon 1% Granular is an insecticide that provides systematic activity in plants when it's applied to the soil or other media. Watering, timing, and rotation are key to successful application. This product can be used for ornamentals, fruit and nut trees, nurseries, interior plantscapes, and vegetables in greenhouses. It effectively controls aphids, thrips, whiteflies, soft scale, and mealybugs. Offers 12 weeks of control on ornamentals plants for resale grown in the nursery or greenhouse. If you have any questions about this product by DavesPestDefense, contact us by completing and submitting the form below. If you are looking for a specif part number, please include it with your message.